Have you ever looked at a Ford Transit – generally used as spacious and functional cargo vans for small businesses on the go – and thought, “Boy, would that ever make for a great camper!”? Okay, you probably haven’t, but someone seems to have had that thought at some point, and we are all about to be better for it. 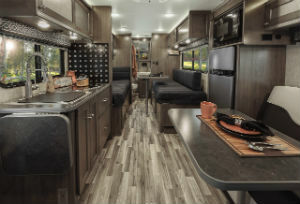 The newest Ford Transit-based motorhome is called the Winnebago Fuse, which is a Class C motorhome. It gets built on the new Ford Transit cutaway chassis, and will appeal to those looking for something a little smaller and more utilitarian than those enormous (and enormously priced) ones you can pretty much inhabit for the remainder of your days. Today we’ll tell you a little more about this latest motorhome option, and if you’re wondering about the Winnebago Fuse Motorhome release date, we’ve got a good idea of when that’ll be, too! Just looking for a cargo van? >> See our Ford Transit options here! What configurations will be available for the Winnebago Fuse? Both configurations are available with the Ford Power Stroke 3.2-liter 5-cylinder diesel, and have their living areas accessible behind the driving compartment. These motor homes are great choices for those of you who like to get outdoors a lot – and we sure live in the right place for you if that’s the case! – but who want just enough comforts to make it easy to get rested on the go without having to spring for hotels. Do Other Manufacturers Besides Winnebago Make Motorhomes on the Transit Platform? Yes! 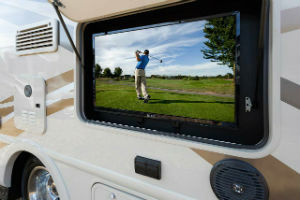 Others include Thor Motor Coach, Forest River Inc, Sunseeker, Forester, Coachmen Freelander and Coachmen Orion. 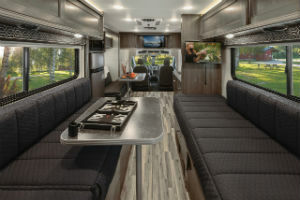 In addition, Transit will be able to offer more choices for Class B Motorhomes for those looking to upgrade their experience a bit. When Can I Get the Winnebago Fuse? The Winnebago Fuse is slated to become available to customers starting in January 2016. Like to know when things are coming out? >> See more release date articles here! Sound like something you’d like? We’re always happy to answer questions you may have – We might not know all the finer points about the Winnebago Fuse or other motorhomes, but we’re certainly willing to help get you pointed in the right directions and we’re definitely experts on the Ford Transit and Ford engines, so let us know if there’s anything we can answer for you there! This entry was posted on Wednesday, November 18th, 2015 at 7:52 am	and is filed under For Fun, Ford Transit, Release date. You can follow any responses to this entry through the RSS 2.0 feed. You can skip to the end and leave a response. Pinging is currently not allowed.